Although referred to as 'The New Jerusalem' image from Dürer’s Apocalypse, it is unclear whether this image is really meant to represent the New Jerusalem. If so, it is notable for its rendering of Jerusalem as contemporary Nuremberg, the town in which Dürer himself lived. Heavily influenced by the Koberger Bible of 1483 CE, Dürer’s Apocalypse of 1498 was one of the first printed Apocalypses and one of the most successfully early printed illustrated books. Capitalising on the new medium of print, Dürer visualised the entire narrative of Revelation in just fifteen images. The condensed visual narrative has both a synchronicity and an immediacy that earlier book versions of Revelation often lacked. Throughout the series, the heavenly and earthly realms are clearly demarcated, by clever placement of clouds and dense hatching over the human portion of the sky to evoke the spiritual darkness that plagues it. However, in this final image the sky is clear save for a few birds: it is as if a new dawn has broken, ushering in the New Jerusalem. At the gates, of the city an angel stands ready to usher in the multitudes. 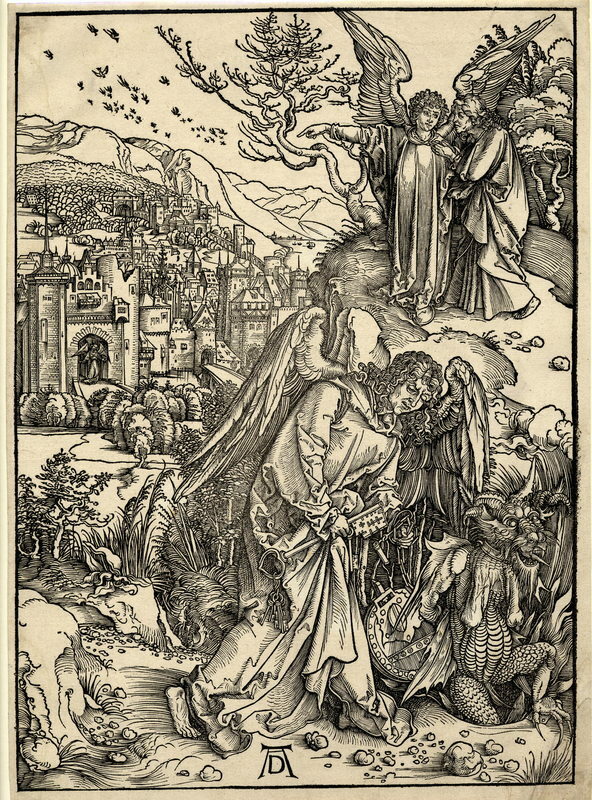 Nevertheless, the placement of the ‘chaining of Satan’ at the foreground of the image (Revelaation 20:1–3), leaves the viewer unsure of what Dürer intends to depict: the 'chaining of Satan' is the prelude in Revelation to the ushering in of the Millennium that precedes Armageddon and the Last Judgement. It is thus unclear whether Dürer meant this as an evocation of the New Jerusalem, or of the Millennial Age that will precede the arrival of the eternal city. Either way, we see a return of the urban emphasis in Dürer’s depiction, in contrast to The Ghent Altarpiece, as well, perhaps, as a hint at the idea that the New Jerusalem cannot be satisfactorily visualised by the human imagination at all.